In June of this year, Leah Rosin, BPI’s marketing and digital content strategist, spoke with Rasmus Hother Le Fevre, managing director and corporate vice president, Novo Nordisk Pharmatech A/S (formerly FeF Chemicals A/S), about the company’s rebranding initiative. She began by asking him about the company’s history and reason for the name change to Novo Nordisk Pharmatech A/S. Le Fevre: Novo Nordisk Pharmatech was established in 1949 as FeF Chemicals, acquired by Novo Nordisk in 1986, and has been part of the company since then. On 1 September 2015, the company’s name was changed to Novo Nordisk Pharmatech. For the past 10 years, we have moved toward becoming a full-fledged pharmaceutical company and changed our product offerings, a transition that is finally completed. It was our wish to find a name that mirrors our focus and future aspirations. Our new name reflects the connection to our parent company, Novo Nordisk, and at the same time it reflects our business focus on the pharmaceutical and biopharmaceutical industries. I am very proud to be able to say that we are the leading worldwide supplier of high-quality ingredients for the biopharmaceutical and pharmaceutical industries. We manufacture and supply products such as recombinant insulin for cell-growth media and pharmaceutical-grade quaternary ammonium compounds (Quats). Rosin: What are your future plans with Novo Nordisk Pharmatech in this area? Le Fevre: We have a clear vision and strategy to develop the business over the coming years. Our customers see us as the market leader and innovator in the industry, and to meet the coming challenges requires vision and direction. We will continue to match and outperform the market as required. Rosin: I can imagine that this type of rebranding could serve as a lesson to small biotechnology companies that are bought by larger companies. What were some of the challenges to marketing and customer recognition of having had such a differentiated brand? Le Fevre: One of the main challenges was that very few of our customers recognized that FeF Chemicals was a part of a much larger company. So now we can leverage fully the Novo Nordisk brand value. The name conveys a clear recognition and understanding of what our company stands for in terms of quality, reliability, and consistency. Our staff and customers are very excited to know and understand what this name change will mean for them in future. A newcomer to the market has to understand the emotional effect that a brand name can have. If a customer cannot understand or connect to the name, then the chance of securing that business becomes harder. Rosin: Are you planning other changes to product lines, global locations, or personnel at Novo Nordisk Pharmatech? Le Fevre: Apart from branding the company with a different name, we plan no immediate changes to the product lines; however, we will listen to our customers and the market and develop the business as required. We have a very proud heritage in Denmark and have extremely capable people within the organization. As the business increases, our focus may require further expansion so we can serve the market appropriately. I have the privilege of working with some of the best people in the market, and we will continue building on this heritage. Rosin: With the human insulin and quaternary ammonium compounds (Quats) focus within the pharmaceutical market, what activities are in the works as far as products and time lines are concerned? Le Fevre: Our overall objective is to deliver technologies that aid in the development of high-purity end products such as therapeutic proteins. Our focus areas are at early cell-culture development with insulin. With ourQuats, our focus is within vaccines and healthcare products. We also have in-house expertise in chromatography for the development of downstream processes for capture of high-value products. We are working with some of the leading pharmaceutical companies and leading academics to show that insulin and Quats can improve productivity and stabilize processes. Scientific compelling data are key to our strategy; therefore, we invest in generating facts and substance. Our unique selling point (USP) is that we can offer the highest purity product linked with good manufacturing practices (GMP) documentation. As Novo Nordisk Pharmatech, I envision a company that pioneers the market and does not follow the latest trend. Rosin: Have you seen a rise in the demand for vaccine raw materials? And in which other areas do you see an increased demand? Le Fevre: Yes, we have seen an increased demand for both our Insulin and Quats in the vaccine market. With the rise of cell-culture–based processes in vaccine prophylactics, customers have seen that the addition of insulin to their processes has both stabilized and enhanced their productivity. With Quats, we are the market leader in terms of documented quality and purity. Traceability and accountability are what we deliver today to the world’s leading vaccine manufacturers — hence our growth in this market. We now see an increased demand from Asian and South American markets because of increased quality requirements from health authorities. I believe that Novo Nordisk Pharmatech is correctly positioned to be the partner of choice, not just today, but for the long term on the global stage. Rosin: What do you hear from customers about increased demands from increasing production levels? How are you positioned to meet their needs? Le Fevre: We see a double-digit growth in all pharmaceutical markets, and this is an integral part of our business and plans for the next five to 10 years. In our planning stages we ensure that we can meet not only our current manufacturing demands, but also build in a contingency for future growth. We have a robust risk mitigation strategy because many patients rely indirectly on our products. Rosin: How are you planning to communicate the name change and new business direction to your customers? Le Fevre: Because many of our products are part of pharmaceutical regulatory filings, we have to inform all our customers in due time. We kick-started our communication of the new name in February and have had continuous dialogue with our customers since then. We formally launched the new name to the market on 1 September 2015. Our new name and logo can be seen on all company materials and advertisements and at conferences and congresses. The employees are very excited about the new name, and we have received very positive feedback from the market. Rosin: You mentioned accounting for the name change in regulatory filings. How burdensome is it for a regulated company such as yours to deal with such a rebranding? Rasmus Hother Le Fevre earned an MSc in forestry from the University of Copenhagen and completed training at the Wharton Business School. He started as a production planner in Novo Nordisk in January 2000. In January 2003 he became the global head of shipping and customer service. In November 2004 he took up the role as director and then became the corporate vice president of the purification plants. In January 2010 he moved to Zürich, Switzerland, to take up the challenge as global marketing director, heading the Victoza Launch Execution Team. 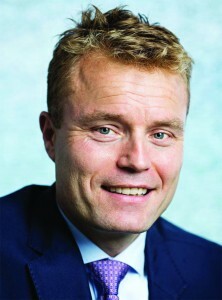 In September 2012 he became the managing director and corporate vice president at FeF Chemicals A/S. Le Fevre: We are used to operating in a GMP environment; therefore, the new name has been handled in the same way as other changes to our filings. We have managed specific time lines for submitting these changes to the authorities, and we will be supporting our customers in updating their own filings. Rosin: What are the key learnings from this change process? What do you see as the next challenge for Novo Nordisk Pharmatech? Le Fevre: An early start and thorough planning are crucial to success. Clear and precise communication is fundamental to every branding exercise linked with dedicated team work. I believe my team is now in a position to deliver our long-term strategy and vision. The next challenge is to look into the new emerging therapies and position our products to meet our customers’ needs. This has been a great exercise for the organization, and I am very proud of the outcome.